Pest Control in and around your home is very important for a number of reasons. First of all pest carry and spread many diseases and can contaminate your food supply. These contamination's can result in your family suffering with unnecessary illnesses up to and including hospitalization, not to mention the cost of medications to treat these illnesses. Termite Protection in Southeast Louisiana is not a luxury it is a necessity! We live in perfect conditions for termites to flourish. We currently provide Pest Control and Termite Protection in nineteen (19) parishes in Louisiana and we are growing throughout the State. Always a clean and professional job. Can't say anything but great company to do business with. Thanks, Blue Star!!!!!!!!!!!!!! Blue star has always been responsive to my needs. I’ve had several reps and all were friendly and professional. I highly recommend Blue Star for your pest control. I have been using Blue Star for over 8 years and I am completely satisfied with their service. I highly recommend Blue Star. Thank you for sharing your experience with us. We truly appreciate your business. Blue Star does a great job. Always on time and haven't seen a bug since we started using them. Very easy to work with and explains everything. From the moment I first contacted Blue Star, I have been very happy with the service. The prices are very reasonable compared to other pest control companies that I contacted, there was no contract to sign, my service tech is friendly and helpful, and most important to me, this is a Christian owned company. Thank you! quick response, Josh came out and wonderful, polite and very honest!! Professional friendly service with continuous successful results! Always willing to go the extra mile to get the job done. Honest, effective and professional. And I don't have pest issues. Couldn't ask for more. We truly appreciate your patronage since 2015. Always on time. Reasonable prices. Always calls before coming out. AWESOME to hear! Thank you for being one of our GREAT customers since 2012! Great service! Friendly front office and technicans. Our philosophy is that we can only exist because of our GREAT customers. It is great to hear that we accomplished our goal with your experiences. THANK YOU! Excellent Service and communication with clients. Thank you for sharing your experience and being the best part of Blue Star. Very helpful great service great people. Taking excellent care of my elbow Grandma. Thank you for sharing your experience with us. We pride ourselves in assisting the elderly in our community. We service many accounts where the children or grandchildren have had to move away because of career jobs and need to make sure their family members are taken care of. We help be the eyes on site for them. Glad we can help. Thank you for being one of our GREAT customers! I don't see any. They don't come near the house because they spray around the house. Thank you for sharing your experience us. If you ever do need additional services our phones are answered 24/7 by a live person to assist you. i am very happy with blue star pest control. i have used them for several years now. they are always professional on phone and during inspections. Thank you for allowing us to protect you and your family unwanted pest. We have been using Blue Star for a number of years now. They are efficient and on time. We couldn't be more pleased with there service. Very professional and knowledgeable. Very pleasant to work with. Prices reasonable. Highly recommend. Courteous and efficient service. I use Blue Star for my home and both of my businesses. I highly recommend them for any pest control need! Thank you for your comments and being one of our GREAT customers! Excellent on time service and follow up, friendly staff and competitive prices! Thank you for trusting us to protect your home from termites. We look forward to a long business relationship. Blue Star is definitely considered family! Comparatively speaking, Blue Star's prices are affordable and reasonable, particularly, after being a long-time customer the 50% discount on our 10-year renewal contract helped out when money was tight. Chris' knowledge and professionalism speaks volumes. I strongly recommend Blue Star pest control to protect one of your largest investments --your lovely home! Unlike some companies that give low pricing to only new customers. We believe in the philosophy of rewarding our loyal customers with the best possible pricing for all of our services. Great services as always glad our house is finish and Blue Star is out there protecting it. Thank you for being one of our GREAT customers, we truly appreciate your business. The service and technician was good. Blue Star is professional and timely. They are quick to respond to any pest issue and always take care of the problem. Living in the south presents us with a lot of pest challenges. We focus our training and philosophy on understanding the importance of responding quickly to those issues. It is great to hear our customers are experiencing what we train. THANK YOU! for sharing your experience with us. Very professional business. I feel my home is protected. Thank you and rest assured we are here if you need us! prompt, courteous, efficient, professional, thorough. Am very pleased with your service. Chris was very helpful and courteous. Thank you for sharing your experience. We appreciate your business. had swarmers, the techs explained clearly, which termites were cause for concern, which were just a nuisance. Thank you for sharing your experience with us. We emphasis education with all of our co-workers, that is why our website focuses on educating consumers about pests. It is great to hear our co-workers are sharing their knowledge with our customers. THANK YOU! Very happy with Blue Star. Thank you! Excellent monthly service and response to occasional calls. 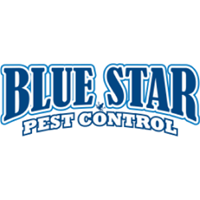 I have had Blue Star Pest Control for over a year and have found them to be very professional and reliable. Their employees exhibit a caring attitude who want you to be satisfied with their service. I highly recommend this company.